Chef Amar Santana is one of Orange County’s hottest rising stars who is undeniably transforming the OC culinary scene into a food destination. 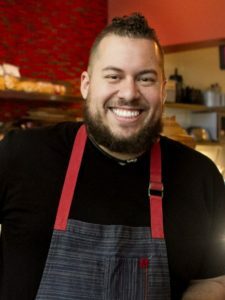 His impressive career crescendo in 2012 occurred at the age of 30, when he opened his widely successful flagship restaurant, Broadway By Amar Santana in Laguna Beach. His globally influenced menu includes unexpected flavor profiles and artful presentations, reflecting his zeal for food and for life. Almost immediately, critical acclaim, accolades and countless rave reviews rolled in. Santana attributes his success as a direct result of ambition, drive, passion, and modestly, extraordinary talent. Born in the Dominican Republic, Santana migrated to the US at the age of 13 and his family settled in Queens, NY. During his sophomore year in high school, an accidental enrollment into a cooking course sponsored by Careers through Culinary Arts Program (C-CAP) forever changed his life. Santana’s teacher immediately recognized great potential and encouraged the 16-year-old to further his training through an internship at Chef David Waltuck’s Chanterelle, one of New York’s famed French restaurants. In 1999, Santana entered a culinary competition sponsored by C-CAP and won a two week long trip to London’s prestigious Le Cordon Bleu. Upon graduating high school, Santana enrolled at the Culinary Institute of America in Hyde Park, NY on a full scholarship awarded by C-CAP. In 2001 Santana began an externship at Aureole under the mentorship of Chef Gerry Hayden, for which he returned upon CIA graduation as a full time cook. Within a year he became the youngest person to be named Sous Chef in one of New York’s busiest and most demanding kitchens. After honing his skills at Aureole, Santana was tapped to serve on the opening teams for Chef Palmer’s highly acclaimed Charlie Palmer Steak and Fin Fish in Reno, NV proceeded by Charlie Palmer at The Joule in Dallas, TX. In 2007, at the age of 25, after undergoing a world tour on the Seaborne Cruise Line as a consulting chef, Charlie Palmer selected Santana to run the kitchen of his first Southern California restaurant, Charlie Palmer at Bloomingdale’s South Coast Plaza. As Executive Chef, Santana earned Charlie Palmer four stars from the Orange County Register and one of Orange County’s Top Ten restaurants by Orange Coast Magazine. Embracing California’s culinary landscape helped to diversify his craft and inspired an appreciation for the integrity of ingredients. Passionate about all things pork, Chef Santana also cultivated and mastered his skills with dried meat and charcuterie. Since the birth of his culinary career at the age of 16, the dream to open his own restaurant came into fruition in September of 2011. Broadway By Amar Santana evokes a New York ambience, with a beautifully designed kitchen and an intimate speakeasy cocktail bar. Since opening a year ago, Santana has garnered countless praise-worthy articles and acclaim, among them: Orange Coast Magazine’s Top Ten Chefs of 2012; OC Metro’s Best Chef’s in Orange County; OC Weekly’s Best Restaurant of 2012; and, a place on the Open Table Hottest Restaurant List. Ultimately even the awards take a back seat to his singular pursuit of expressing his passion through food and providing an unforgettable gastronomical experience. Chef Santana’s fearless enthusiasm and adventurous spirit continue to drive him towards greatness.